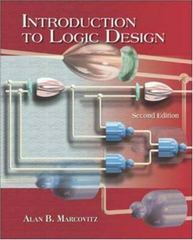 Introduction to Logic Design 3 Edition Introduction to Logic Design by Alan Marcovitz is intended for the first course in logic design, taken by computer science, computer engineering, and electrical engineering students. As with the previous editions, this edition has a clear presentation of fundamentals and an exceptional collection of examples, solved problems and exercises.The text integrates laboratory experiences, both hardware and computer simulation, while not making them mandatory for following the main flow of the chapters. Design is emphasized throughout, and switching algebra is developed as a tool for analyzing and implementing digital systems. The presentation includes excellent coverage of minimization of combinational circuits, including multiple output ones, using the Karnaugh map and iterated consensus. There are a number of examples of the design of larger systems, both combinational and sequential, using medium scale integrated circuits and programmable logic devices.The third edition features two chapters on sequential systems. The first chapter covers analysis of sequential systems and the second covers design. Complete coverage of the analysis and design of synchronous sequential systems adds to the comprehensive nature of the text. The derivation of state tables from word problems further emphasizes the practical implementation of the material being presented.